This is a comprehensive two-year degree program of both theory and practical experience designed to prepare students for a career in aquatic animal husbandry. If you are interested in starting an exciting new career in the aquatic animal husbandry profession, the Aquarium Science Program is for you. Graduates in aquarium science have had a 94% rate of finding jobs in the industry upon completion of the program. Classes begin each fall. Space is limited so apply today. Oregon Coast Community College (OCCC) has an articulation agreement with the Oregon Institute of Technology (OIT), for students graduating with an Associate of Applied Science in Aquarium Science to enable the students to pursue a Bachelor of Applied Science in Technology and Management at Oregon Institute of Technology (OIT). Students admitted into the two year degree program will receive an Associates of Applied Science (AAS) Degree in Aquarium Science after successfully completing all necessary prerequisites and required coursework for the program. Click on the link below to view the two year degree curriculum map for the program. Applicants for the two year degree program must have received a high school diploma or GED and may have completed some college level coursework. 1. Effectively communicate, verbally and in writing, scientific concepts, research findings and ideas to professionals and the general public. 2. Maintain, analyze, diagnose and repair aquarium life support systems and their components. 3. Perform basic water quality analysis using standard testing equipment. 6. Work within a group to conceptualize, plan, construct and manage environments that promote healthy of fishes and invertebrates. 7. Apply fundamental knowledge and skills in science, mathematics, and communications for success in a professional or academic setting. Larry Boles is a native of North Carolina and studied Biology and Chemistry at the University of North Carolina at Chapel Hill. He earned a Master’s degree in Marine Fisheries Science from the Virginia Institute of Marine Science at the College of William & Mary in Virginia, where he focused on the behavioral ecology of crustaceans, including crabs and lobsters. Larry’s biological field work includes extensive experience in the Bahamas and Florida Keys as well as projects in the Chesapeake Bay, the Hudson River Estuary in New York, and animal collecting in Puget Sound, Washington. After teaching at Old Dominion University in Virginia and Southwestern University in Texas, Larry transitioned to working in Zoos, Aquariums, and Natural Science Centers where he has been involved in animal care and informal science education for many years. Larry joins OCCC after a short stint as the Assistant Husbandry Curator at the North Carolina Aquarium at Fort Fisher. Before that he worked several years as a Research Associate for Walt Disney’s Animal Programs at the Seas with Nemo and Friends, Epcot Center. His work with Disney’s Aquarium and Veterinary staff included research on improving the welfare and health care of animals in human care and on improving techniques for the restoration of coral reefs in the Caribbean. I am honored and excited to be part of the Aquarium Science team at OCCC. The program provides a unique curriculum and unparalleled staff and faculty that prepare students to become future leaders in the Aquarium industry. Alyssa Squiers is from the Hill Country of Texas. Her love of Biology and Marine Science brought her to Corpus Christi, TX to earn a B.S. in Biology at Texas A&M University – Corpus Christi. After graduating with her Bachelor’s degree at TAMUCC, Alyssa stayed to pursue her M.S. in Marine Science, focusing on a local species of coral and the habitat it provides in the nearshore waters. While completing her Master’s degree Alyssa began working as an Aquarist at the Texas State Aquarium, working her way up to Director of Animal Care. It was there she developed a love for the aquarium industry as a whole, and teaching those interested in aquarium science. 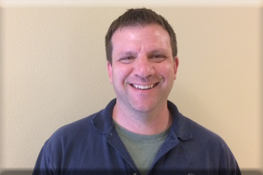 Dr. Tim Miller-Morgan, DVM, is originally from Tacoma, WA and has been residing on the Oregon Coast in Newport for 19 years. Dr. Miller-Morgan has earned a B.S. in Biology from the University of Puget Sound and a B.S. in Wildlife Biology from Washington State University. He later achieved his Doctorate in Veterinary Medicine at Washington State University’s College of Veterinary Medicine. 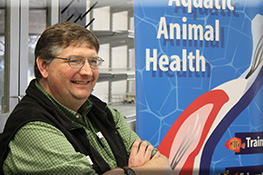 He currently works in the capacities as the Lead for the Animal Health Program, Extension Veterinarian of Aquatic Species for Oregon Sea Grant, and Assistant Professor in the Department of Biomedical Sciences, College of Veterinary Medicine, at Oregon State University and Hatfield Marine Science Center. Dr. Tim has been an integral part in the development and delivery of the Aquarium Science Program since its beginning in 2003 and currently teaches Fish and Invertebrate Health Management (AQS 270) and Animal Husbandry in a Research Capacity (AQS 245) for the program. Kevin teaches Introduction to Aquarium Science (AQS 100) and the Aquarium Science Practicum Courses (AQS 110 and 111. 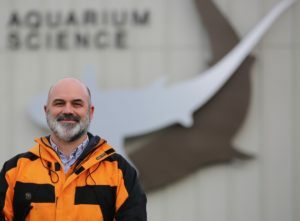 In addition to teaching, he is the Special Projects Coordinator at the Oregon Coast Aquarium. A native of Massachusetts, Kevin attended UMASS Dartmouth where he received his Bachelor of Science degree. 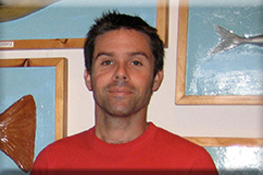 Prior to Oregon Coast Aquarium and OCCC, Kevin has worked Disney World and the New England Aquarium. Kevin has also been involved with the Aquarium Science Program as a student practicum and intern mentor since its early stages of development. Matt received his Bachelor degree in Fisheries and Wildlife from OSU during which time he also worked for the U.S. Coast Guard Marine Safety Office and the Environmental Protection Agency Western Ecology lab. Matt conducted his Master’s research at the National Institute for Nutrition and Seafood Research in Bergen, Norway as a U.S.-Norway Fulbright scholar. He earned a Ph.D. at Oregon State University where his research focused on larval fish nutrition, with an emphasis on the delivery and requirements for water-soluble nutrients. Matt teaches Reproduction and Nutrition of Aquatic Animals (AQS 232). Matt’s goal in the program is to change the paradigm concerning how we think about feeding and nutrition in public aquaria. Sage is originally from the deserts of New Mexico where the only option for a salt water fix and a dive with sharks was at the Albuquerque Aquarium. After begging for a job from age 14, the aquarium hired Sage right out of high school to be a full time aquarist while she worked toward her biology degree from UNM. The job at the Albuquerque Aquarium fueled her passion for being a professional aquarist. She moved to Newport, OR in 2008 to complete the One Year Certificate in Aquarium Science at OCCC. With Certificate in hand Sage moved to Southern California where she lived and worked for Sea Life Aquarium in Carlsbad for almost four years. 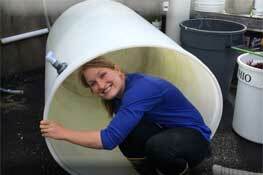 Sage is glad to be back in Oregon, as of July 2013, working as a Senior Aquarist at the Oregon Coast Aquarium. She is equally excited to also be working back at the school that gave her all of the tools she needed to be successful in this industry. Sage now works in the Aquarium Science Facility monitoring water quality, managing aquarium system care and maintenance, assisting students with assignments and attending to other duties as assigned. She can always be asked for instruction, help and advice. Clare graduated from Boston University in 2007 with a B.A. in Biology with a specialization in Marine Science. 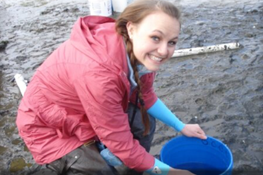 Following graduation, Clare worked as a fisheries observer aboard commercial vessels in Alaska and then Oregon. Over 700 sea days later, she decided to pursue her long-time interest in aquariums and enrolled in the Aquarium Science Program, completing a One Year Certificate in 2015. 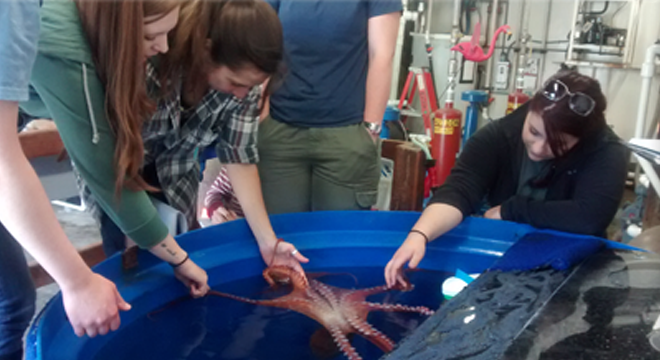 Following graduation she interned and, later, worked as an aquarist at the Oregon Coast Aquarium. 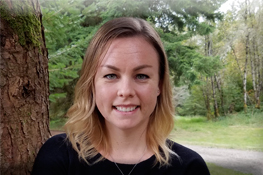 Through experiences in the AQS Program and at OCA, Clare discovered a passion for exhibit design and interpretive planning and is currently working as a freelance contractor for exhibit and aquarium design and construction projects. Oregon Coast Community College is committed to providing equal opportunities for students with disabilities throughout the College community. Students with documented disabilities are entitled to reasonable accommodations under Section 504 of the Rehabilitation Act of 1973 and the Americans with Disabilities Act of 1990. Our philosophy is to maximize your independence and self-reliance, providing a variety of support options to assist you in achieving your educational and/or vocational objectives. To receive services, you must submit documentation of your disabling condition(s) to the Dean of Students. To initiate support services, please contact the Dean of Students at 541-867-8511 or ccarlson@oregoncoastcc.org. Students are responsible for requesting, in a timely manner, accommodation and documenting the nature and extent of their disability. The application process for the 2019-2020 academic year is now open. Feel free to email us with questions regarding the Aquarium Science program.